LONDON--(BUSINESS WIRE)--The global hair care market is expected to post a CAGR of over 3% during the period 2019-2023, according to the latest market research report by Technavio. A key factor driving the growth of the market is innovation and portfolio extension leading to product premiumization. Hair care product manufacturers are focusing on the development and launch of new and innovative products to cater to increasing consumer demands. In the present scenario, consumers are at a constant lookout for more efficient and novel products that suit their requirements and lifestyle. The hair care marketers are launching technologically advanced products to fulfill the untapped needs of the consumers, and these products are priced higher than the normal hair care products. For example, Alterna Haircare by Henkel, a premium professional hair care products manufacturer, offers Bamboo Smooth Anti-Frizz AM Daytime Smoothing Blowout Balm and PM Overnight Smoothing Treatment. These products are free of sulfate, phthalate. and paraben and protect against frizz and humidity. The products are developed from bamboo extracts and do not contain any petrochemicals and synthetic colors. Such innovative offerings are driving product premiumization, and new products are being launched as luxury hair care products or premium hair care products. This market research report on the global hair care market 2019-2023 also provides an analysis of the most important trends expected to impact the market outlook during the forecast period. Technavio classifies an emerging trend as a major factor that has the potential to significantly impact the market and contribute to its growth or decline. The revenue generated by the global online hair care market has been growing gradually over the period 2012-2017. Growth in online sales is expected to increase significantly and have a positive impact on the overall hair care market by the end of the forecast period. Consumers lack time to visit physical stores to purchase products owing to their hectic lifestyle. The convenience offered by online platforms drives their use among the consumers. In addition, factors such as rising internet penetration and increasing adoption of digital products, such as tablets, smartphones, and laptops, have accelerated online sales. Many vendors are selling hair care products through e-retailing, which helps in promotion as well as enhancement of these brands. Online retailing has become one of the most important channels for the sale of retail goods and services. In addition, both marketers and retailers are adopting omnichannel retailing to facilitate a seamless shopping experience for customers. “Apart from increased online sales, factors such as growing number of fashion-conscious consumers is boosting the growth of the market. Changing and dynamic fashion trends and rise in awareness of the availability of new, more effective, and safer hair care products has led to a significant increase in the use of these products. At present, consumers use hair care products not only to protect their hair and scalp and cover gray hair but also to look presentable or to enhance aesthetic appeal. Celebrities have become role models for consumers in creating a fashion statement. Thus, the increasing number of fashion-conscious consumers is expected to propel the growth of the hair care market,” says a senior analyst at Technavio for research on consumer services and personal care. This market research report segments the global hair care market by product (shampoo, hair color, conditioner, others) and geographical regions (APAC, EMEA, and the Americas). The shampoo segment led the market in 2018 with a market share of more than 32%, followed by hair color and conditioner respectively. However, during the forecast period, the hair color market is expected to post the highest incremental growth, followed by the conditioner segment. 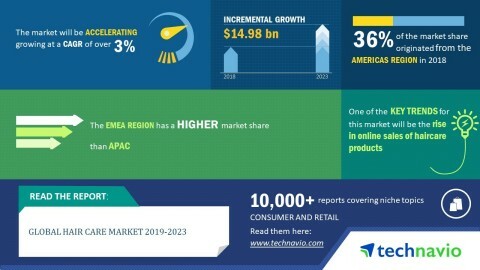 The global hair care market is set to post a CAGR of over 3% during the period 2019-2023, according to the latest market research from Technavio.